Google Android and Google Chrome have finally come together…sorta. Great timing, as this coincides with Google I/O 2016 which has exploded on the scene on Wednesday May 18th 2016, which I’ll be writing about in a bit. 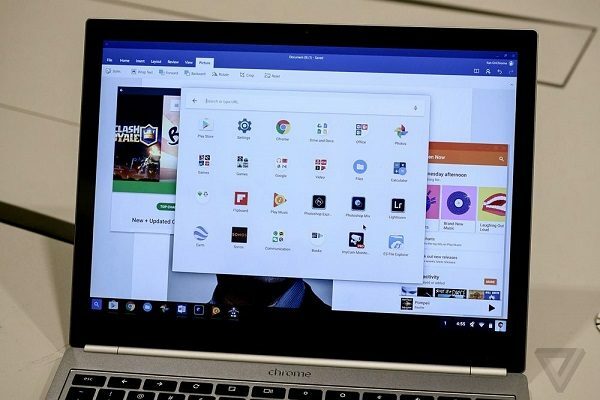 Actually, Google has finally made their Android Apps available for touchscreen Chromebooks; this means that the Chromebook Pixel 2, Asus Chromebook Flip and Acer Chromebook R11 will come with the Google Play store baked in. Google plans to make other Chromebooks that have no touch screen have access to the Google Play Store. This will give many users of Chromebooks, mainly K-12 students in the US of A access to Android Apps such as the ever popular Facebook Messenger, Spotify, 3D Games and even Google’s Photos and Play Music Apps. As most Android Apps need no Internet to work, this technically may be the first time that Google is allowing users to download content to be stored on their hard-drive. Support for both full-screen and windowed modes is provided, making multi-tasking a breeze.